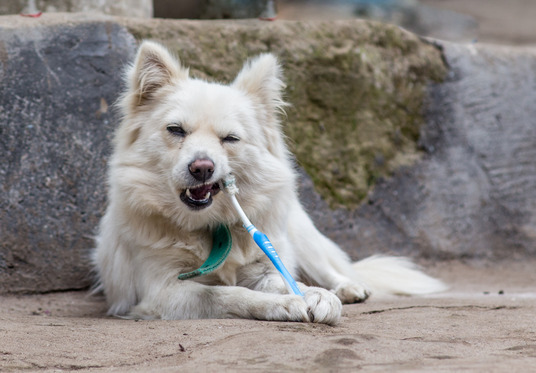 Home >> Resources >> Pet Care >> Dental Care for Cats & Dogs: Should I brush my pet’s teeth? If so, how? Rule number one: NEVER use your own toothpaste to brush your dog or cat’s teeth. The ingredients in human toothpaste can make your pet very sick. Luckily, there are many feline and dog toothpastes available in flavors like tuna or chicken that your pet will surely enjoy. Additionally, a pet’s toothbrush is usually smaller, softer and more flexible than human toothbrushes. Many veterinarians are happy to provide brushing lessons and carry brushes specifically for animals. First, have your pet get used to the taste of the toothpaste. Let him lick some off your finger, and then off the toothbrush so he gets used to the texture. You may want to do this over the course of a week until your pet looks forward to licking the toothpaste. If he continues to dislike it, trying switching to a different flavor. For best results, hold your cat or small dog in your lap. You can lean medium-big sized dogs against a wall or a couch. Once your pet is relaxed, gently raise the lip on one side of the mouth and begin brushing gently from the gums downward. You may want to start with just a few teeth in your first sessions, and slowly work your way up to brushing all teeth. Continue working your way around the outside of the teeth until you have brushed the entire mouth. Don’t forget the back upper molars and the canines, as these teeth quickly build up tartar. Do not worry about brushing the inside of the teeth, focus on cleaning only cheek-facing surfaces. You don’t need to rinse your pet’s mouth, but you can give them access to a water bowl when finished. Afterwards reward your dog with a treat, playtime, or petting to positively reinforce that the brushing process is fun! While it’s optimal to brush your pet’s teeth everyday, a few times a week is a great start. The biggest challenge will be getting your pet used to the routine. Once he starts to like it, it won’t feel like a task for either of you. The important thing is to start brushing as soon as possible. Just like with children, the earlier they start, the more quickly and easily they will adapt to the routine. While cleaning your pet’s teeth regularly can prevent additional veterinary bills down the road, it does not replace regular dental examinations. Make sure your pet still receives professional dental cleaning at least once a year. Also keep an eye out for unusually bad breath on your pet or excess drooling. This is often related to gum disease or tooth decay. Remember, your pet cannot tell you when he is in pain, so make sure to pay special attention to your pet’s mouth and take action when something is out of the ordinary.